Among budget models the ProForm Spacesaver 600 elliptical comes equipped with a surprising number of features for such a low price. If you like options like an mp3 port, interesting programs, a heart rate monitor, bright display, and an adjustable stride -- all at an economy price -- then the ProForm Spacesaver 600 may be perfect for you. But if you want stability and mechanical soundness, you’ll want to keep looking. UPDATE: The Spacesaver 600 has been discontinued to make way for the all new Smart Strider series. Check out all of the latest ProForm elliptical reviews here. Experts warn that snazzy features are costly; that is, they are included at the expense of something else. In the case of the Proform Spacesaver 600 elliptical, that something else is what’s under the hood — or isn’t. Cheap plastic components and a poor warranty are the top two items trainers will point out to you when trying to talk you out of this machine. Consumers tend to feel that the cheap ProForms sure look like a million bucks, but a cool bright display and lots of programs has fooled them into ignoring its flaws. These budget machines suffer from noisy rides, frequent break-downs, and less than satisfactory customer service. 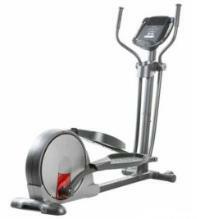 Ellipticals in the $400 to $700 range are likely to have many mechanical problems. That’s not to say that every owner of a Proform Spacesaver 600 will have troubles right out of the box. Light to moderate users may have no trouble at all especially if the elliptical trainer is used sparingly and it’s only one of many components in your extensive home gym that includes weights, treadmill, bike, and so on. But if it is to be your only piece of exercise equipment, you need a machine that offers better quality, stability, and warranty. For about the same amount of money you’d pay for the Proform Spacesaver 600 elliptical, may we suggest you consider the $799 NordicTrack Commercial 1300 elliptical (not to be confused with the NordicTrack Elite 1300 model at $1299 -- also a good unit) which gets numerous “Best Buy” ratings.